Temptation is everywhere! Trust me, we’re located right next to the amazing Dinkel’s Bakery! While it’s okay to indulge in a treat every now and then (please brush afterwards!) 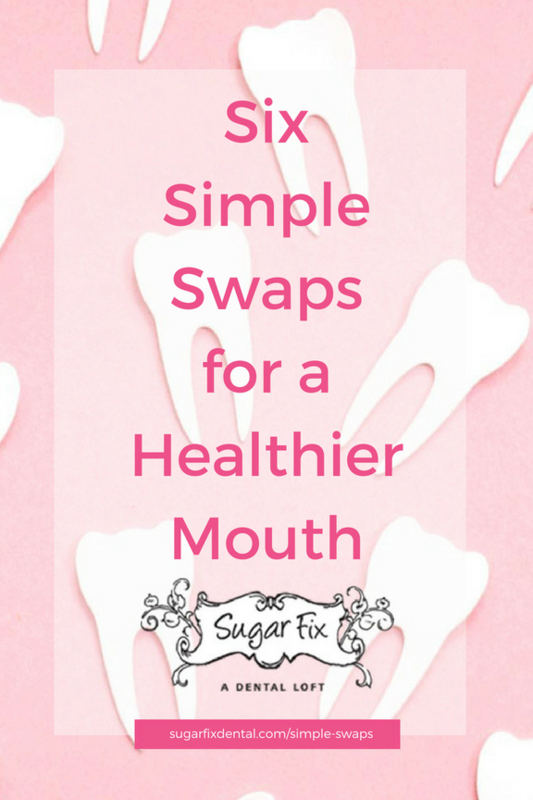 there are some simple swaps you can make for a healthier mouth. When you drink a can of soda, the sugar combines with the bacteria in your mouth, which forms an acid. This can wear out your enamel and lead to cavities. Diet soda is no better. Instead, try sparkling water! It’s sugar free and it’s more popular than ever, which means lots of brands and flavors to try. We always stock Bubly because there’s an adorable smile on the can! If you’re still popping that sugary pink bubblegum, it’s time to say goodbye. You absolutely need to be chewing sugar-free gum, but even better is gum with xylitol. This sugar substitute has the added benefit of reducing plaque. We like that! Aside from the health benefits of whole wheat, overly starchy foods like white bread and potato chips can get stuck in your teeth really easily. The sugars they contain break down and can lead to cavities if we’re not vigilant and brush right away. Are you an ice chewer? Chewing on ice cubes or ice chips can be really refreshing and a great way to cool down when it’s hot outside, but it is so dangerous! You can easily crack or chip a tooth or damage your tooth enamel. Instead, cool off with a tall glass of ice water. If you ask most dentists, cough drops really fall into the same category as candy. They sit up against your teeth and the sugar (yes, there’s as much sugar in cough drops as candy) can really to a number on your teeth. Herbal tea can be a great way to ease a cough or sore throat without the possibility of damage. This one is probably obvious, especially if you have braces. Sticky candy can cause all sorts of problems. If you have a craving for something sweet, you’re much better off reaching for the chocolate. Dark chocolate would be even better, since it’s been shown to have other health benefits. Take care of your teeth by always brushing and flossing at least twice a day (check out our absolute favorite floss). Avoid consuming too many sugary and starchy foods, and drink water after each meal or snack to rinse your teeth. In addition to these tips, it’s important to get regular checkups. Dr. Emery and the Sugar Fix Dental Loft team can help get your mouth in tip top shape! Contact us to set up your next appointment.